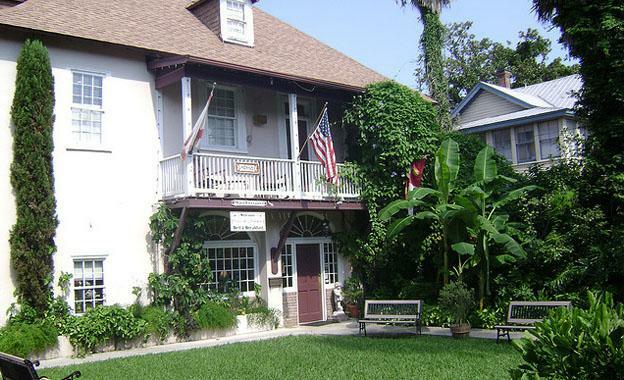 If you are going to be vacationing in the quaint and historic city of St Augustine, Florida, consider stayingat the Casa de Solana Bed and Breakfast. This beautiful old home has been transformed into a bed and breakfast that is both elegant and homely, with all the right details and touches of luxury and thoughtfulness. St Augustine is the oldest city founded by Europeans in North America, and it retains an Old World style charm that visitors really love. This is one of the most “walkable” cities in the country, with the older parts of town, the Matanzas Bay and the best sights in the area close by. Casa de Solana has a long history; it was built in 1763. The larger manor house is flanked by other buildings that are part of the complex, all looking down onto a jasmine-perfumed garden. The hotel is located on Aviles Street and is only a block away from the Bay, with parking about three blocks away. This can be a bit inconvenient, but due to zoning codes parking has to be separate and outside of the historical area. The Casa de Solano has all the modern comforts you want and need, all within the comfortable and beautiful European confines of the compound. Every room and suite has its own private bathroom, along with cable television and Wi-Fi internet access. There are ten rooms in total, eight of which have large whirlpool bathtubs, and the majority of the rooms have a private balcony and fireplace, which can be used from November through March. Guests are treated to gourmet coffee every morning, as well as a complimentary home made breakfast. Afternoon socials with wine and refreshments allow guests to mingle and meet, and the hotel lends bicycles to any guest who wants to tour St Augustine in this manner. They also give out complimentary passes to Old Town, where they can take in the sights of this old colonial capital. Casa de Solano is a perfect place to stay for a romantic occasion such as an anniversary or wedding, but it is also great to use as the actual location for the celebration. The courtyard, with its myriad of fragrant and beautiful blooms, is just right for a small wedding or elegant party, and the staff will cater the event with its signature culinary masterpieces. If you want a picnic or lunch basket, strawberries and chocolate, a romantic meal for two, or a special treat, the kitchen staff is happy to prepare it. Casa de Solano also has a fully licensed massage therapist on staff who can be booked for private or couples’ sessions with prior notice. This small and elegantly welcoming bed and breakfast is very popular during the high and low seasons, so make sure to book ahead and call for prices and specials. Casa de Solano often offers packages on stays during the low season with discounted per-night rates, so check their web page for more information and up-to-date rates and availability. Aishwarya Vohra the author of the “Casa de Solana, St. Augustine: Bed and Breakfast” is a travel blogger from Florida. In her leisure time she loves to experiment with cooking and read about travel hotspots.